There is a traditional ‘Alms round’ taking place from Monday to Friday during the Vassa (Rains Retreat) currently being held at Sunyata. Collecting alms (food) is a traditional practice that dates back to the time of the Buddha. Monks are not allowed to prepare their own food or to store food after midday. Instead they walk through the local area in the morning and can be offered food into their bowl. Whatever the monks receive in offering will be their food for the day. In accordance with the tradition established by the Buddha, for more than two millennia the Buddhist monastic community has relied for its material well-being on unsolicited offerings of food and other requisites from the lay community, everything that the monks use; from their robes to their bowl to their daily food has been offered freely by the lay community. 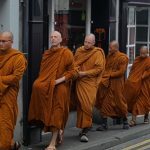 The Buddha established the practice of alms so that the monks would always have a direct connection with the lay community that was based on interdependence. The practice also allows for the cultivation of generosity, a key principle of Buddhist practice. The monks typically offer teachings on the dhamma and guidance, while the lay community offer the ‘four requisites’ to the monastics. These are food, clothing, shelter and medicine. The monks are not allowed to accept or carry money. 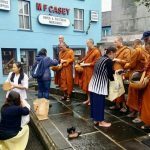 If you would like to come along to see the alms round or to offer some food to the monks and take part in this ancient tradition you can come along to Limerick People’s Park Monday, Thursday and Friday at 8.50am or the O’Connell monument in Ennis on Tuesday and Wednesday at the same time. 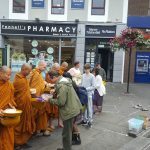 If you see the monks walking through the town it is also possible to stop them and offer them food into their bowls at any point.